The Paper Players Challenge #119, such a lovely sketch! Their DT has created some beautiful things for your eyes this week. Now everything you see except the embossing folder on the banner is Stampin' Up! product. Please feel free to ask any questions. 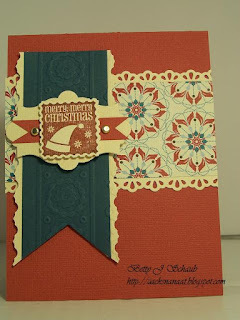 If you want to buy supplies for this card please check out my shop at www.bettystampstx.stampinup.net Also make sure you check my side bar for something special from Stampin' Up! I had to giggle when I read your post because I overthink ALOT! Too much, in fact. We would never know you did here, though...you card looks effortlessly adorable. Great color combo and love how the embossing folder coordinates with the paper! Thank you for joining us at The Paper Players! Betty, I know all about that idea of overthinking! Oh... and pulling out multiple DSPs to try on a card. Sometimes stepping away from it is a great idea. I love what you finally chos and the fact that the embossed circles echo the pattern on the DSP. Great card.